All of Chelsea is covered in ghosts, and Lockwood & Co have not been invited to help fight them. All the other agencies are there. You and I know how unfair that is, and so do Lockwood and his two assistants. They have to persevere with some of the more minor ghostly problems in London, and you and I know how good they are with stuff like that. They only disobey Lockwood’s orders occasionally, risking their lives and making mistakes that could cost people their lives. But on the whole they do well. 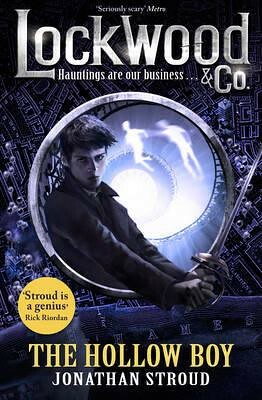 Lucy is particularly keen to try her special abilities to solve the ghosts’ problems, and Lockwood would rather she didn’t. She is getting on better with her dreadful green pal in the jar she carries around, and he in turn has some helpful suggestions for how she could get rid of… Well, I won’t tell you who, but let’s just say Lucy and the boys don’t agree on something of great importance. Brave and talented though Lucy and Lockwood are, I’m not sure where they would be without George. He is often quiet and always hungry, but generally researches their cases thoroughly, discovering what others have missed or not even bothered to look up in the first place. I have to admit to seeing him in a new light in this third book about our psychic investigators. Old enemies surface, as do new ghosts, and that person I was referring to above. Chelsea needs saving, and then there is the mystery of Lockwood’s sister. This is another jolly, thrilling and amusing instalment in the Lockwood saga. I have to admit to panicking towards the end, when it looked like George’s cake-eating was about to take a beating. But I’ve been reassured there are many more ghosts coming my way.